“A Dark Day for the People of Puerto Rico”: U.S. Senate Moves to OK “Colonial Control Board” | Democracy Now! The U.S. Senate is expected to vote as soon as today to set up a federally appointed control board with sweeping powers to run Puerto Rico’s economy to help the island cope with its crippling debt crisis. The bill, known as PROMESA, passed the House by a bipartisan vote of 297 to 127. In the Senate, Robert Menendez has led the opposition to the bill. On Tuesday, he waged a four-hour filibuster to protest the bill. AMY GOODMAN: Juan, before we move on with the rest of the show, there is a major vote on Puerto Rico in the U.S. Senate today. JUAN GONZÁLEZ: Yes, there is. The Senate will—looks like, will finally vote on what to do on the so-called PROMESA bill. This is the bill that both the Obama administration and Republicans in the House passed, you know, got through the House, initially, a couple of weeks ago, which would establish a means for Puerto Rico to restructure its $72 billion in debt, but would also impose a financial control board—what I and other people call a colonial control board—over the commonwealth of Puerto Rico. The Republican Majority Leader Mitch McConnell moved this week to have a cloture vote, which will occur today, because McConnell wants to prevent any amendments on the Senate floor from those who might have problems with the current bill. So he wants to—he’s going to go for a 60-vote cloture vote and then proceed to have a vote on the full bill, because they’re trying to rush to get this bill through before the July 1 deadline, in a few days, when Puerto Rico is sure to default on a huge portion of its debt. It has to pay about $2 billion on July 1. So, yesterday, Senator Bob Menendez did a filibuster. For four hours, he grabbed the Senate floor and continued to condemn the bill, to condemn the efforts to prevent the Senate from having any kind of amendments. But in the process, he also really—for anybody who watched it on C-SPAN, you got a real lesson on what is the problem and why people are calling this a colonial control bill. For instance, Menendez said that, contrary to what the Obama administration has been saying and what many Republicans in Congress have been saying, the people of Puerto Rico are completely opposed to this bill. There was a recent poll, showed that 69 percent of Puerto Rican voters on the island are opposed to the PROMESA bill, the very bill that the Senate is about to pass, and 54 percent are opposed to any kind of outside control board running the affairs of Puerto Rico for the next five to 10 years there. And so, there’s huge opposition on the island to the bill, and yet the Congress is moving forward. 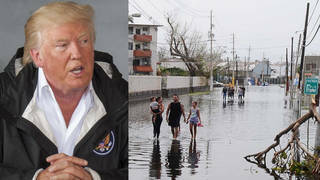 Unfortunately, there’s a lot of liberal Democrats that are supporting this bill; some liberal organizations, like Jubilee USA, astonishingly, has come out in favor of the bill, because they’re all insisting that this is the only way, as bad as the bill is and the problems that it has, it’s the only way for Puerto Rico to be able to restructure its debts and to avoid a rush to the courthouse by bondholders. But what Menendez made clear is that there’s going to be a rush to the courthouse anyway, because as the bill passes, the bondholders, many of them, are going to go to court to challenge the constitutionality of the bill. So it’s not as if there’s not going to be legal challenges on July 1. But Menendez went on for four hours. Bernie Sanders participated for a short time in the filibuster. So did Maria Cantwell. But for the most part, it seems that there’s a sufficient number of Democrats and Republicans that will vote to approve this bill today. AMY GOODMAN: Where did a key player, a key progressive in the Democratic Party, come down? And that is Elizabeth Warren, who was out on the campaign trail this week. JUAN GONZÁLEZ: Well, Elizabeth Warren has not said anything. She was critical, initially, of the bill. Elizabeth Warren has not said anything about this. My sense is that she’s going to vote for it, as well, unfortunately. There’s still a possibility that Bernie Sanders or Menendez could launch another filibuster today in the debate over the cloture vote, the final debate, or the bill itself. But it seems unlikely at this point. And it’s astonishing to me how so many liberals in this country, who rail about American aggression abroad, are being so silent over this absolute imposition of colonial control by the United States government over the affairs of Puerto Rico. And Jack Lew, the secretary of treasury, spent almost all day yesterday basically meeting with Democratic senators to convince them, to pressure them to support this bill. So it’s going to be a really dark day for the people of Puerto Rico, who are completely opposed to this bill, if the Senate votes today to approve it. AMY GOODMAN: Well, we’ll of course continue to follow this, the issue of Puerto Rico so key.